Gerudo town is a city in Zelda Breath of The Wild. It is located in the harsh desert in the southwestern corner of the map. When you find it, you’ll be denied entry. Only women are allowd inside. Since the fate of the world is at stake, you’ll have to look for a way to sneak in. In this guide, we’re going to show you how to enter Gerudo Town in Zelda Breath of The Wild. If you talk to the man outside the city gates, near the shrine entrance, he’ll tell you he’s heard of someone who managed to fool the guards and enter the city. He’ll tell you to look for the man in Kara Kara Bazaar. Follow the road northeast from Gerudo Town, and you’ll reach it in no time. Once there, climb to the top of the spire. 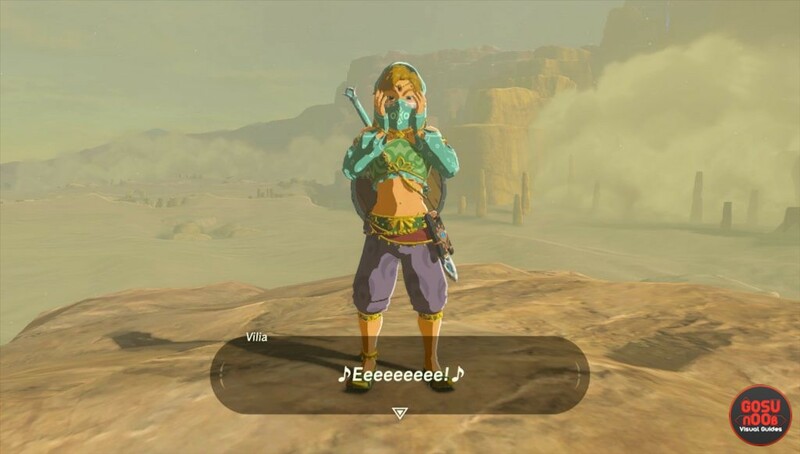 You’ll see a woman in a traditional Gerudo costume. Talk to her. During our short conversation, we picked “study her face” and “you’re very beautiful”. She then offered to sell us an exact replica of her outfit for 600 rupees. The armor makes Link look like a girl, which allows him to enter Gerudo Town without a hitch. He seems embarassed about the whole thing, but it serves its purpose. The set also grants heat resistance, so it’s useful in more ways than one. Once inside, you’ll probably want to get the Gerudo secret password as well. Wait until night falls, then look for a little girl returning home to the house next to the cantina. Approach the window and listen in on the conversation. It will reveal the town password. I got on the top of the spire and there’s no one there. What am I missing? Wait until nighttime then they should be there. @Julia You have to be at that location at noon, otherwise there’s no one there. There’s a fire nearby that you can sit at to make it noon. The “woman” you see is obviously a man. I mean, you could have at least put it in quotation marks. Also, as a side note, there is no other way to get in. You can try and go above the guards, but if you go in the city borders, the cutscene is pretty good. Hell yeah I am! This Goku/Jiren is beast. Talk to Benja at the gerudo town entrance first.